Product Information – In-depth look at information that I have gathered from several sources. My Personal Experience – A walk through of my experience using the GMSS. Product Recommendation – A recommendation based on my experience. Feel free to browse through any or all sections to learn more about the GMSS. 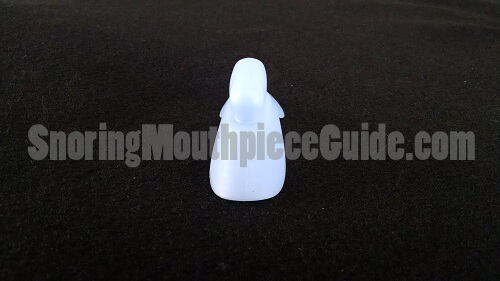 In addition, you may also want to check out some of the other snoring mouthpiece reviews that I have completed in the past. How Does The GMSS Work? While Mandibular Advancement Devices currently dominate the anti-snoring device market, a newer type of product classified as a Tongue Stabilizing Device or TSD is beginning to consume an increasingly large portion of the market share. 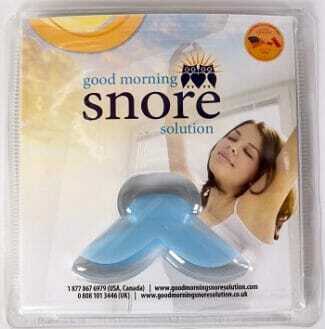 One such device is the Good Morning Snore Solution. Like other TSD’s, this one works by using a suction bulb to pull the tip of the tongue forward where it remains while you sleep. The theory is that the tongue actually relaxes while sleeping, creating a blockage in the airway and causing snoring. Like the MAD, this device is also effectively treats snoring. The company even goes as far as saying that it is effective at treating mild to moderate sleep apnea in some cases. One of the greatest advantages of this product is the fact that it is ready to use out of the box. Other oral appliances require that you boil and bite the mouthpiece to fit or make complicated adjustments. The GMSS is a one size fits all solution that will work in just about any circumstance. It simply rests between your gums and inner lip. The suction bulb grabs and holds the tongue forward, preventing it from moving back. There is no need to mold, trim or adjust it. Looking at this simple device, it’s quite difficult to imagine how the GMSS can prevent snoring. Pretend as if you are sleeping and emulate the sound of snoring. Now, stop for a second and stick your tongue out through your teeth and resume the sound of snoring. Did you notice a difference between the snoring sound with your tongue inside versus your tongue outside of your mouth? I just tried it and found that while it was easy to generate snoring sounds at first, it was very difficult to recreate the snoring sound with my tongue out. While this experiment is rather unscientific, it should give you an idea of whether or not the GMSS will work for you. Why does holding your tongue forward prevent snoring? The sound of snoring most often originates in the airway. 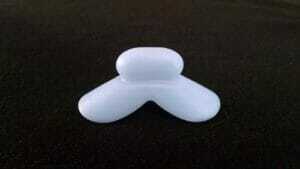 Airway tissue becomes loose and flap against each other, generating this sound. When the tongue is held forward, the tissue surrounding the airway tightens and prevents airway tissues from flapping around. TSDs such as the GMSS is a simple snoring solution that has been clinically proven to work in several studies. The GMSS was developed by Dr. Leslie Dort who currently practices dentistry in Calgary Canada. Once created, she conducted clinical studies on this device to verify its effectiveness. The results indicated a clinically significant reduction in sleep disturbances. 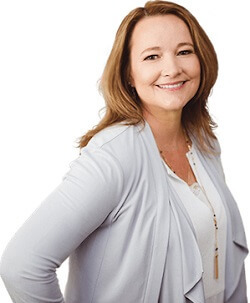 In 2007, Dr. Dort teamed up with another Calgary dentist, Dr. Nancy Markley who created the company Mpowrx to market and sell the GMSS. What started off as a small startup, now has a far global reach with multiple distribution centers in operation worldwide. As you may already know, one of the easiest way to check the trustworthiness of a company is to visit the Better Business Bureau (BBB) and search for the company that you are interested in. For well over 100 years, the BBB has been helping consumers in North America locate businesses, brands, and charities they can trust. They are a non-profit association who provides unbiased information to consumers and also serve as an intermediary between businesses and customers, helping to settle thousands of disputes annually. A business must meet certain criteria in order to become BBB accredited. In addition, they must pay a minimum of $623 per year to maintain their accreditation. Larger companies often pay over $16,000 a year in BBB accreditation fees. 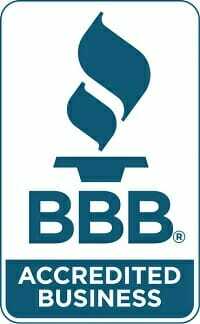 Most companies that are serious about their business seek BBB accreditation. According to the BBB, the Good Morning Snore Solution is sold by Mpowrx Health & Wellness Products 2012 Inc who is based out of Calgary, AB. Records show that they have been in business since June 2007 and became accredited in March 2012. At the time of this writing, they are maintaining an A+ rating with a few minor complaints, mostly concerning return shipping. All complaints have been quickly addressed by the company and there are currently no open cases. Being an accredited member of the BBB and maintaining an A+ rating with no open cases is a strong indicator that Mpowrx is a trustworthy company that takes their customers and business seriously. Does the GMSS contain BPA? What is Bisphenol A (BPA) and why should you be concerned if your mouthpiece contains this chemical? Also, does the Good Morning Snore Solution contain BPA? Let’s start by answering the first question. BPA is a synthetic compound that has been around for well over 100 years, however, it has been used commercially for only the past 60 years. It is typically used by manufacturers to produce everything from plastic water bottles to sports equipment. It’s found in nearly everything, including your home water supply lines, aluminum can liners, and yes, even in some snoring mouthpieces. 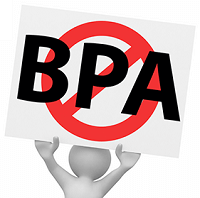 In fact, BPA is so common, over 10 billion pounds are produced annually for manufacturing purposes. While still currently legal to use in the US (with the exception of baby bottles), BPA is continuously scrutinized by regulatory agencies such as the Food and Drug Administration as well as the European Food Safety Authority because of increasing evidence linking the chemical to health problems. Although the jury is still out, several studies suggest that BPA may cause endocrine system disruptions, especially at higher levels of exposure. Oral appliances are placed inside the mouth for several hours each night and if they contain BPA, this chemical may leach into your body. While it’s still debatable whether or not BPA exposure is hazardous to one’s health, it’s best to err on the side of caution and choose a mouthpiece that does not contain BPA. Both the manufacturer’s website and their product packaging state that the GMSS is BPA free. This is a claim that is made by only a handful of companies who manufacturer mouthpieces, GMSS being one of them. Industrywide, there seems to be a relationship between trustworthy companies who receive clearance through regulatory agencies such as the FDA and the use of BPA free material in their product. Generally speaking, most FDA cleared oral appliances are labeled as BPA free. Does The Good Morning Snore Solution Contain Latex? Did you know that approximately 1%-2% of the general population has a latex allergy? Health care workers and individuals with conditions such as spina bifida who have undergone multiple surgeries are at greater risk of developing a latex allergy. Symptoms of an allergy to latex typically begin within minutes of exposure and often include a runny or stuffy nose, hives, difficulty breathing, wheezing and tightness in the chest. 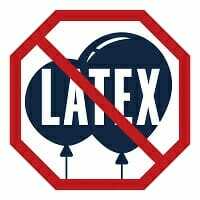 While most who are reading this review probably do not have a known allergy to latex, repeated exposure to latex products can lead to a latex allergy. The Department of Labor estimates that between 8%-12% of healthcare workers are allergic to latex due to constant exposure from wearing latex gloves. For this reason, if you are going to use a tongue stabilizing device on a daily basis for an extended period of time, it’s a good idea to choose a product that does not contain Latex. This leads us to the question – “Does the Good Morning Snore Solution contain latex?”. Looking at the manufacturer’s sales page and frequently asked question section, I was unable to immediately locate the answer to this question. After doing some further searching on their website, I found a statement within a blog post that was published in February of 2016 that answers this question. The statement reads that the GMSS “utilizes a latex-free medical grade resin”. So, to answer this question, no the GMSS does not contain latex. Where Is The GMSS Made? As a consumer, I’m usually interested in the country in which my goods are made. This is especially true if the item that I’m purchasing will be used for health or personal use. All too often we hear about toxic imported goods making their way into the hands of unsuspecting consumers. Depending on where a product is produced, there may be little to no government oversight which sometimes leads to questionable manufacturing practices to reduce costs. For this reason, it’s a good idea to choose personal items, such as snoring mouthguards, that are manufactured in developed countries. According to the manufacturer’s website, the GMSS is produced in the USA and Canada, two countries with strict government controls on manufacturing. The GMSS is made from a medical grade silicone material that’s fairly durable and resistant to wear. How long it lasts really depends on the individual patient and how well it’s cared for. The manufacturer suggests that the average lifespan is somewhere around 12 months. A person who properly cares for their device and does not chew on it while sleeping should expect it to last for a longer period of time. 2016 UPDATE: I’ve owned my GMSS for just under three years now and while my original GMSS is showing signs of wear, it’s still functional! I actually upgraded my old clear GMSS to the new “refreshing blue” a few weeks ago. I still keep my original device as a backup and now use the blue one as my primary TSD. Can the GMSS Be Used To Treat Sleep Apnea? One question that I often receive from my readers is whether or not TSDs such as the Good Morning Snore Solution can be used to treat obstructive sleep apnea. This question is a bit complicated, primarily because the answer will vary depending on your geographical location. Technically speaking, TSDs are considered medical devices and most countries have an agency that oversees the sale of such medical devices. In the United States, the Food and Drug Administration (FDA) is the regulatory agency. Health Canada, Australian Register of Therapeutic Goods (ARTG) and the European Commission are the medical device regulatory agencies for Canada, Australia, and the European Union respectively. Each government agency uses its own method to classify medical devices and they set certain guidelines for the sale of each device to their citizens. As for the United States, the GMSS is technically considered a class II medical device and is only approved for the treatment of mild to moderate snoring and is not currently approved for the treatment of sleep apnea. While most countries’ regulatory agencies allow the GMSS to be marketed for both snoring and sleep apnea, Mpowrx is unable to market it in the United States as a treatment for sleep apnea, simply because of different restrictions imposed by the FDA. So, while the exact same product is being sold in every country, the local government ultimately has a say in how it can be used. Regardless of how your government classifies the GMSS, it’s always advisable to first speak with a qualified medical provider who can assess your situation, offer a proper diagnosis and explore all treatment options. As mentioned, the GMSS is a class II medical device which requires clearance from the FDA prior to being sold. According to the FDA database, Dr. Markley submitted a 510(k) summary (K081965) to the FDA in mid-2008. By October 2008, the FDA had made a substantially equivalent determination, granting Mpowrx permission to market this device in the United States for mild to moderate snoring. At the time of this writing, the FDA website indicates that the company’s status as “Active”. In other words, the FDA has determined that the GMSS is equivalent to a similar product that was previously cleared by the FDA. This gives the company the green light to bring their product to market. 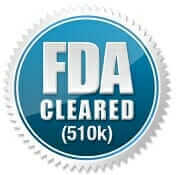 Note, “FDA Cleared” should not be confused with “FDA Approved” which is typically reserved for high-risk medical devices and requires a more in-depth review process. Does the GMSS Require A Prescription To Purchase? 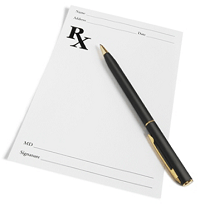 Depending upon where you live, a prescription may be required before purchasing the GMSS. While some countries have tighter restrictions on anti-snoring and sleep apnea products, such as MAD’s and TSD’s, others will allow you to purchase such devices off the shelf with no questions asked. While considered a class I medical device in most countries, the GMSS is considered a class II medical device in the United States. According to the FDA, Mandibular Advancement or Tongue Stabilizing devices such as the GMSS have greater regulatory controls to ensure safety and actually require a prescription from a medical doctor. Luckily, obtaining a prescription from an MD may be easier than you think and doesn’t necessarily require that you to even leave your home. How is this possible? Allow me to explain. Before being able to finalize your purchase, you are asked to complete a short online sleep health history questionnaire in which a series of health-related questions are presented. Once complete, your answers are carefully examined and a determination is made. If it’s determined that you are a good candidate for a TSD, a script will immediately be written and you will then be able to finalize your purchase of the GMSS. So, it’s as simple as correctly answering a dozen or so “yes” or “no” qualifying questions before being able to move forward with the checkout process. When the GMSS first came out, it was only available in clear. In late 2015 the company announced that they would be offering the GMSS in “refreshing blue” which is semi-transparent blue in color. The actual design has remained exactly the same, only a blue colorant has been added to the device. As for availability, the manufacturer’s website states that the refreshing blue mouthpiece is currently only available for sale in the United States and Canada. Those in all other countries will receive the clear GMSS. In all likelihood, it will eventually make its way into other countries. In Which Countries Can It Be Purchased? The GMSS is sold in dozens of countries worldwide. 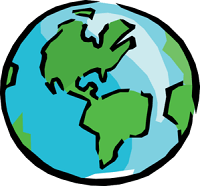 The company has established a global distribution network in Canada, the US, the UK, Australia, and Brazil to reach their customers quickly and efficiently. According to the GMSS website, they are actively seeking medical device licensing in several new areas, so if your location is not listed below, it may soon be. How much would you expect to pay for the GMSS? The manufacturer currently sells a single pack for $69.94 plus $9.95 shipping in the US & Canada, while the two-pack sells for $99.94 plus $9.95 (US&Canada). Shipping costs will vary depending on your location. 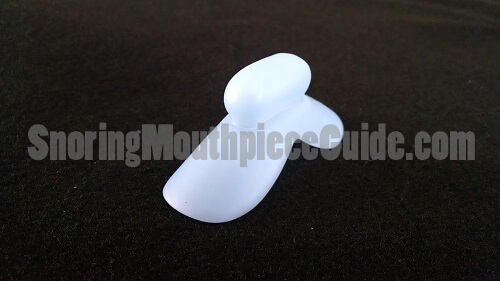 GMSS has offered readers of SnoringMouthpieceGuide.com a special discount. Click on “Visit GMSS Website” below and use promo code SMGSAVE10 to save 10% on your order. While this may sound like an excessive amount of money for such a simple device, it’s important to consider that a lot of money and effort goes into developing and marketing a clinically proven, FDA, ARTG, and EC cleared prescription product. There is about a 25% savings per mouthpiece when your order the double pack. For the bargain shopper, the double pack is a great choice. Use one, give the other away to your bedroom partner who also snores. Use one, give the other away as a gift to a fellow snorer. Use the extra one as a backup just in case yours becomes damaged or lost. Use one, keep the other in your vehicle for overnight stays. Use one and keep one to use when the first wears out. The manufacturer suggests replacing the GMSS every 12 months, although I’ve found that it tends to last much longer than this. 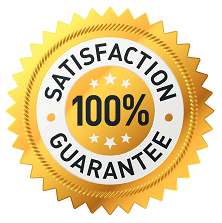 The GMSS is offered with a 30-day Guarantee where you are able to test their product to see if it works for you. According to the company’s policy, you can return the GMSS within 30 days for a full refund of the purchase price if you are not satisfied. The return process seems very straightforward and is listed on their website. Email the company with your invoice number and reason for returning. After a customer service representative reviews your return request, you will be issued a Return Authorization (RA) number. Return the GMSS to the company along with your RA number. Once received, you will be issued a refund for the entire purchase price, not including shipping charge. They state that you must return it in its original package. This no-risk return policy makes it a lot easier if you are on the fence and can’t decide if this product is right for you. What Are The Actual Customers Saying? A quick look at the reviews from those who have tried this product shows that it is quite effective at treating snoring and is a great alternative to bulky mouthpieces that take up a lot of room in the mouth. Until recently, the MAD was the industry standard and there are many cases where people tried several different devices with failure before discovering the GMSS. 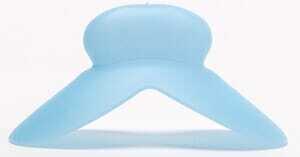 While it’s not the most fashionable solution, it delivers as promised and helps to control snoring. Several reviewers have been using this TSD for over a year now without the need for replacement. The manufacturer does, however, suggest replacement every 12 months or so. Quite a few denture wearers report having ordered this mouthpiece and had great results. It is one of the few stop snoring devices that can be used by those who wear dentures. Others have found success in preventing teeth grinding while preventing snoring. Teeth grinding is nearly impossible since this product does not allow you to close your mouth all the way. On the downside, several people reported tongue soreness and a bit of drooling the first few nights of use but this went away in almost every case. One reviewer claimed that he couldn’t keep the suction bulb stuck to his tongue the entire night. The first consideration, how I feel in the morning, is perhaps the most tell-tale indicator of whether or not a mouthpiece is effective. First, it’s necessary to understand that both snoring and sleep apnea are caused by a narrowed airway. 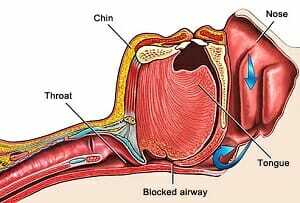 The airway can become restricted, tissues flap against each other (snoring) and in some cases the airway will completely collapse, resulting in apnea. In the event that the airway collapses, your body will instinctively cause you to awaken in order to capture your breath. A sleep-awake cycle occurs all throughout the night and you are usually completely unaware of what is going on. In many cases, the individual will wake up over a dozen times each hour throughout the night and not even know that this is occurring. For this reason, you may wake up feeling tired, even if you sleep for 8, 9, or even 10 hours. The second way that I determine effectiveness is what I like to call “the wife test”. While I’m a heavy snorer, my wife also occasionally snores. Fortunately for me, I almost always fall asleep first and as a heavy sleeper, my wife’s snoring rarely bothers me. While great news for me, she is often forced to lay awake for several minutes or sometimes hours each night nudging me, trying to stop my snoring. Trust me, if a mouthpiece that I try is not effective, my wife will be the first one to tell me all about it in the morning. Finally, the third way that I am able to tell if I am snoring is by simply setting up a sound recorder. There are numerous smartphone sound recording apps to choose from, some are even made specifically for capturing and evaluating the sound of snoring. For me, I use a simple free sound recording app. While I’m sure that other apps offer more bells and whistles, I try to keep things simple, as this has always worked well for me. I use an app that allows me to adjust the microphone sensitivity so that it doesn’t pick up sound from my wife. Also, the app that I use only records when sound is present and remains off when silent. This is helpful because I usually only have to listen to a few minutes of the recording instead of 8 hours. Before going to bed, I start the recording and then lay the phone next to my pillow on the opposite side that my wife sleeps on. Upon rising in the morning, I play back the recording and listen to see just how bad my snoring was. If I wake up and there are 6 hours of recorded sound, I’m immediately able to tell that the device is not working. When I first saw this anti-snoring device it seemed a bit strange and I admit that I was a bit skeptical. After all, this thing resembles a pacifier and I really didn’t understand exactly how it worked. So, I ordered one and didn’t know what to expect. After answering a few “yes” or “no” questions, my order was approved and it shipped the next day with tracking information. While the company is based out of Canada, I found out that they actually have a fulfillment center in the US. Four days after placing my order, it arrived at my doorstep. This was a relief as receiving a package from outside of the US can sometimes take weeks if held up in customs. The GMSS arrived neatly contained inside of a plastic clamshell package. Inside, there was one device, the instructions, and a Polident denture tablet which I used to clean the GMSS before use. The instructions were straightforward and took just a couple of minutes to read over. Since it requires no fitting or trimming, it was ready to use straight out of the box. I dropped a tablet into a cup of cold water and then submerged the device for 10 minutes before allowing it to dry on a paper towel for several hours before putting it to use. Before going to bed I simply squeezed the bulb, stuck out my tongue, and let the suction naturally pull my tongue in. For the first night, I let out as much air as possible to ensure that it didn’t fall off of my tongue. The next morning I woke up and felt refreshed and well rested. I know from past experiences that this was a good indication that the device had worked. The GMSS was still well stuck to the end of my tongue and I had to squeeze and maneuver it off. I felt a bit of soreness after removing it, but this eventually dissipated after about 30 minutes. I took a look at my phone and saw 45 minutes of sound was recorded from overnight. While I waited for my wife to wake up, I listened to the recording and was surprised to hear that not a single snoring sound exited my mouth. The captured recording was simply the sound of me breathing into the microphone at 4:00 am when I must have rolled over and my face landed right on top of my phone. My breathing sounded very smooth both inhaling and exhaling. No snoring, pauses, or throat clearing sound. Later, when my wife woke up, I learned that she stayed awake reading for 2 hours after I had fallen asleep and didn’t hear a sound. This was very encouraging to hear and I was now excited to continue using it for the next two weeks. The second night I followed the same procedure except I increased the sound recording sensitivity to ensure that I wasn’t missing anything. With the GMSS in use and the recording on, I quickly fell asleep. Upon rising the next day, I felt great once again, the only audio that I captured was 1.5 hours of the sound of smooth breathing and once again it had passed the wife test. Unfortunately, I had once again experienced some soreness for the first few minutes of the day. While it was working well, my only complaint was that it made the tip of my tongue sore in the morning. I had checked the company’s website and they suggested not squeezing all of the air out which reduces the suction and should relieve some of the tongue tenderness. Before going to bed for the third night, I had followed this advice. I woke up for the third morning feeling well rested and had experienced another soundless night. The GMSS was still secured to my tongue, however, this time I did not experience the soreness that I had experienced the first two night. Great, the suggestion had worked! I simply had it too tight on the tip of my tongue. After the third night, everything was smooth sailing. The device continued to work night after night for the next eleven days and the tenderness on the tip of my tongue had never returned. Using it had quickly become routine and easy to keep up with. I simply placed the unit on the end of my tongue before going to bed, removed and cleaned it in the morning and allowed it to air dry. I had really grown to like the fact that it’s so compact yet still extremely effective. In the end, I was no longer a skeptic but rather a believer. 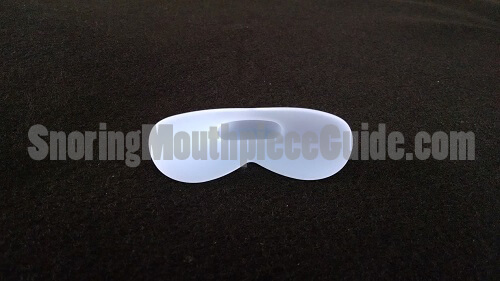 Although completely different than any other snoring mouthpiece that I had tried in the past, it really does work well! Although it seemed sort of odd at first, I soon became accustomed to wearing it. 2016 UPDATE: After buying my very first snoring mouthpiece, I was simply amazed by how these things worked and wanted to help other snorers. Three years ago I started to test every product that I was able to get my hands on and write an in-depth review. 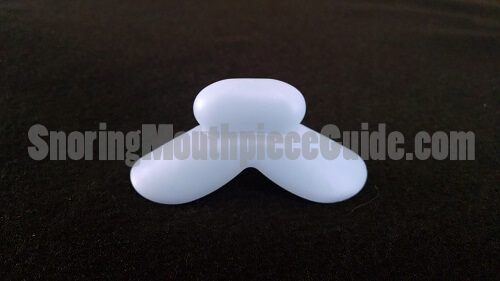 Since then, I have reviewed over 2 dozen snoring mouthpieces and shared my opinion on each. Over the years, I’ve received multiple emails from people who thanked me for introducing them to the GMSS. Three years and many mouthpieces later, the Good Morning Snore Solution has remained an all-time favorite that I still use today. 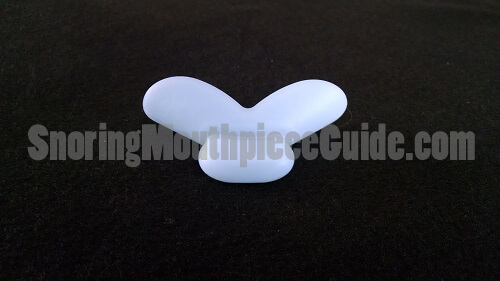 After learning about the GMSS and then putting it to the test, it’s quite clear that this product is hands-down one of the best snoring mouthpieces on the market. Having an actual dentist behind it increases credibility and the fact that it is clinically proven, BPA free, latex free, made in the USA and cleared by the FDA shows that the company has gone to great lengths to ensure that you are receiving a safe and reliable product. With so many unregulated and untested snoring mouthpieces making an appearance on the market today, it’s important to consider where your mouthpiece comes from and whether or not it’s safe to use. There are a disturbing amount of products on the market that are made of questionable materials and have not been tested by a government regulatory agency such as the FDA. No matter which product you choose, always ensure that it has been cleared by the FDA or a similar regulatory agency. While on the higher end of the price scale, this is something that should be expected with any new and innovative product in the industry. It takes a lot of capital to properly launch a prescription medical device. Overall, the Good Morning Snore Solution is a less cumbersome alternative to the MAD. Innovative, comfortable and very effective are three words that I would use to describe the GMSS. If not for the higher cost, I would rate this product at five stars.